I was thinking a lot this week about what it takes for healthcare companies to adopt new innovations, particularly those that fundamentally change what has come before. The topic was top of mind because I was at the HealthXL Global Gathering where very large companies and many startups come together to collaborate in numerous permutations with the goal of finding better ways to do business. It is always not just interesting, but inspiring, to see some of the world’s very largest healthcare companies and health systems, even those that under normal circumstances are considered competitors, working hand in hand to learn, grow, change. And it is always fun to see what the startups have in mind to help these mega-companies do things differently and to hear the under-the-breath mumblings of the audience, always rife with skeptics as well as optimists. There are so many roadblocks to real innovation seeing the light of day, even when great ideas are brought forward. And as I reflected on this I recalled the last HealthXL Global Gathering, when Axel Heitmuller of Imperial College London used the children’s book Sparky! to illustrate the challenge that large companies face when seeking to innovate. Sparky happens to be a sloth who essentially does nothing. He lays there in his tree, effectively immobile, even when offered numerous fun things to do by an enthusiastic girl who has chosen the sloth for a pet. The girl seeks to impose her will on Sparky, trying to entice him to play hide and seek or perform tricks – basically asking him to change. Sparky just sits there, barely moving (he does win at the game of Statue). This book perfectly gets at the biggest reason that innovation fails in large organizations: Inertia. Challenge 1: Inertia – The aforementioned Sparky! would be the best choice here, focused on finding new ways to teach a nearly immobile sloth new tricks. Challenge 2: Fear of change – The mantra “but that’s how everyone does it/how it’s always been done” is perhaps the most insidious set of phrases in the English language, designed to thwart anything new through some sort of twisted sense of making the innovator feel like some sort of strange “other.” The best book on this subject is the classic The Story of Ferdinand, the story of a pacifist bull who likes to smell the flowers and doesn’t bow to the peer pressure of the other bulls to snort and fight. But in the end, he is rewarded for his behavior and picked for the honor of appearing in a bullfight despite his unusual approach. In the end, he wins the day by being different. Challenge 3: Not invented here syndrome – So much resistance to innovation is rooted in ego and the ability of people to dismiss good ideas because they aren’t of their own making. Rather than listen and learn, it is easier to ridicule or explain all the reasons why the new outside idea is bound to fail. I love the book Odd Violet on this topic. Violet is a girl who does really unusual things like bring a milkweed pod for show and tell when all the other girls bring their dolls. She thinks completely out of the box and suffers the slings and arrows of raised eyebrows from all the other kids for her lack of conformance and because they would never do those things themselves. But when they finally hear her out, they realize the merit in her approach to the world and finally embrace the new, the odd, the different. The beauty of this story is that it gets people to look past the way they would do things and open their eyes to new possibilities not of their own making. Challenge 5: Misaligned incentives thwart action – The George and Martha Series of books was always a fan favorite in our house and the Split Pea Soup story is a perfect one for this challenge. In this story, Martha is constantly making split pea soup for her best friend George, but unfortunately George can’t stand split pea soup so he pours it out when Martha isn’t looking – in other words he throws away her effort because it is not what he wants but he doesn’t tell her. When Martha sees this, they talk frankly about it and she admits she was only making the soup because it’s fun to make; she isn’t a big fan of it either. In the end, they realize they are working at cross-purposes and agree to find a mutually agreeable lunch that aligns their hunger incentives. Challenge 6: Too busy to innovate/no patience to try new things – A lack of willingness to invest the time to innovate and adopt change is an insidious problem, as new ways often take longer at first but pay off significantly in the end. The Carrot Seed tells the story of a boy who wants to grow a carrot. He plants a carrot seed but everyone tells him nothing will come of it, it will never grow, abandon the quest, there’s no time for this nonsense. And nothing happens for a long time despite the boy’s constant weeding, watering, and effort. But in the end, with persistence and patience, he ends up growing the largest carrot anyone has ever seen. Just as it takes money to make money, it takes time to sow the seeds of change and that time is worth the effort. Challenge 7: Uptake stalls due to failure to coopt the target market/create a shared sense of purpose on the team – This one is a corollary of Challenge 3 above, Not Invented Here Syndrome. Key to success in getting innovations adopted, especially in internal operations, is to create a sense of shared purpose among those who will be affected by the change. It is essential for innovators to create a sense of buy-in and ownership among those to be most impacted by the operational change; failure to do so can mean failure to adopt. The book Enemy Pie is one of my favorites about how to coopt the erstwhile enemy (or reluctant collaborator). The book is about a boy who coopts a bully through kindness, under the guise of a covert operation to feed him “poisonous” enemy pie. The effort is organized by the boy’s dad, who realizes that by teaching his son to “conspire” with “the enemy” he will turn him into a comrade-in-arms and turn potential conflict into collaboration. Challenge 8: The innovation concept doesn’t actually solve an important customer problem – I have written about Hamburger Heaven before because it is my favorite book about marketing. It tells the story of how a rhino-owned diner has a failing business because it’s menu no longer appeals to customers; the diner makes a lame attempt at new meals, but it isn’t until the about-to-be-laid-off waiter (Pinky the piglet) actually goes and listens closely to customer needs does the diner start to thrive. What the diner owners missed was that their half-assed effort at innovation didn’t appeal to customers, but when they took the time to really design products for their target market, the innovation resulted in more revenue than they could count. Challenge 9: The innovation is poorly launched/marketed – It’s no good to have the world’s greatest new idea if no one ever hears about it or if you call your sushi creation “cold, raw, dead fish,” to quote an old joke. I Will Not Ever Eat A Tomato is a book about a little girl who is a seriously fussy eater and announces all of the things she will not eat – a list which includes peas, carrots and especially tomatoes. But when her siblings employ the classic marketing technique of rebranding, turning carrots into “orange twiglets from Jupiter” and tomatoes into “moonsquirters,” the little girl eats her little brains out. Great ideas need great marketing or they sit on the shelf. No doubt there are numerous other reasons that innovation fails in both large and small organizations. I’d love to hear your other reasons and book suggestions that help tell the story of what to do about it (put them in the comments section below)! Children’s books only please – they are far more fun and I like the pictures. Lisa, very cool. Let’s invite authors of children’s book to the next UN Assembly. Here’s one of my favs. 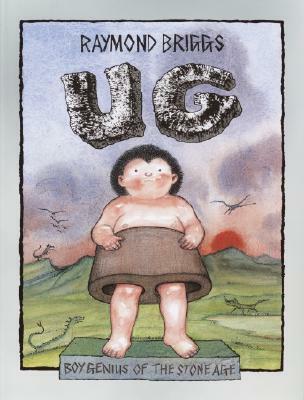 Ug is a whip-smart stone age boy who questions why he and his parents should wear pajamas made of stone. His parents discount all his brilliant ideas, even the one where he works out that circular stones could be placed under objects to help roll them around. I loved reading this book to my boys but loved reading it to myself even more. Because every once in a while even world class innovators need to turn out the lights at the office, go home, climb under the covers, and get some sleep. Some of the smartest people I know aren’t always very good about taking care of themselves. A nice glass of warm milk and 8 hours of getting horizontal can do wonders for one’s attitude and creativity. Just found this blog post and love the whole theme. My partner is a serial inventor and innovator and his offspring are showing signs of it… what a great way to grow little entrepreneurs in training. I loved this blog and thought about a favorite I used with one of my children, Leo the Late Bloomer, about a Lion waiting to get his mane. It parallels the one that is not first to market but soon catches up and learns from the early bloomers. I am sure you will have another take on that one.